We're having a major heat wave here in PA this week...in the upper 90's and even into the 100's...yikes! If you're having the same temps, stay cool! ADORABLE girl! Love the added sparkle to the lollipop! CUTE! Thanks for playing along! So glad you got your new PI girl inky....she's fun! OH! She is GORGEOUS Denise! I always LOVE your coloring and the papers and border punch are FAB as well!! This little sweetie makes me smile! Oh she's just SO cute. I bet it won't be your last PI girl :) Love the little touches of shimmer too! Beautiful card Denise,i love the image and your papers. Yum Yum Yum is RIGHT!!!!!! This card is absolutely DELICIOUS!!!!!!!!!! I love this card Denise. I love the image. I am going to have to purchase some more of these adorable images. I love papers and the pretty cream ribbon too. I love how you added just the right amount of stickles to her lollipop. You are the best girl. Hope you had an awesome birthday. This is just darling, Denise! Love the sparkly lollipop and the triple sentiment.. TOO CUTE!! Beautiful and so cute!! Love it! Aww what a cutie, its beautiful. Its been HOT here too girl!! We have been in our pool almost all day!LOL! Love this adorable card!! Its just so cute! Love that layout too...may have to try that sketch! Ohhh, what a sweet and yummy card. 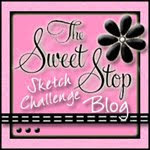 If you wish to visit my blog, please hop on to http://haveascraphappyday.blogspot.com and see the candy that's posted. Thanks for the inspiration. Good morning sunshine :)!!! Your lollipop girl is looking fabulous!!! You rocked the sketch girly!!! Your coloring is the BOMB and I love the paper piecing!!! How sweet and precious, Denise! I like the dazzle on her lollipop. We, too, have been under a heat wave here in Michigan, but it's raining right now (yaaaaaay!) so that should help to cool things off a bit. This is adorable! I bought so many of these images in the digital form, and I never use them because I always have to use a different image for a design team. I never have the time just to play. I do love these images though. They are my FAVS. Love how you did the sentiment and the border punch on the bottom of the image. Cute paper to paper piece with too! SHE IS ADORABLE.. I love what you did with her.. These are fast becoming my favorite gals.. This is so sweet..
OMGosh how totally CUTE is this!!! LOVE the fun colours and papers and your paper piecing is ADORABLE!!! Love all the ribbon and the super cute sentiments!!! Sorry about the heatwave - if I could send you a bit of our winter I would!!! So super cute girl!! I love it!! This is so very sweet! Just love it! Congratulations on being one of MFT's Favorite Finds this week!